For Honor refuses to go down without actions. After some time of only getting around 5,000 loyal players on Steam, the game has decided to get bigger and call 210,000 players to play. How was it able to boost its ranks so fast? By offering pretty much everything for free. A lot of gamers might have forgotten about For Honor, and they really can’t be blamed. It’s a competitive online multiplayer game that trades in the usual trappings of guns and stylish battlefields for swordplay and castles. 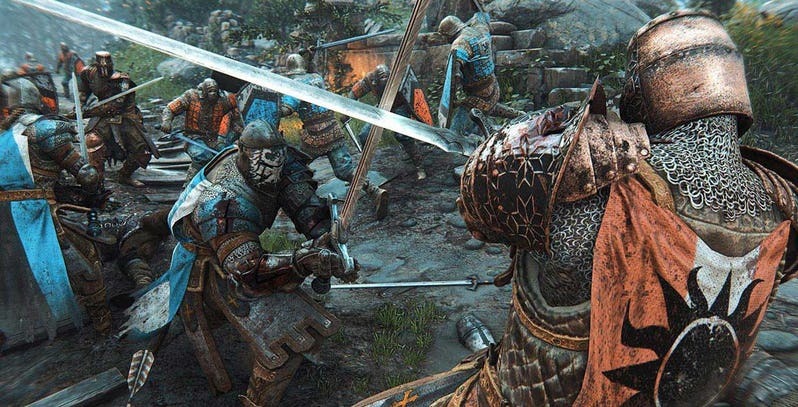 For Honor got a lot of hype because it offered different gameplay which never existed on the market with its older scene and detailed combat system. It officialy came out in February 2017, and ended the year with around 2,000 players per-hour, Source: GitHyp. It seemed like that would be the end of For Honor‘s tragic tale, until Ubisoft decided to go for broke and make the game free-to-play for a limited time. PC players can now download the Starter Edition and take to the battlefield for free completely. Once this fact was made known on the front page of steam, the game’s player base grew exponentially and it also started getting promotions from gaming influencers on social media. The Starter Edition allow players to access to the game’s story mode, all PvP modes, and three of its famous Hero characters right off away. Players can choose between samurai, vikings, and knights, and the three Heroes of that faction will be instantly unlocked. The thing is that all other Heroes will have to be unlocked with Steel, the game’s currency, Steel can also be bought with real cash. Also Unfortunately the Starter Edition is PC only. As all 210,000 of the new players were tracked by Steam. The real question is if Ubisoft can manage to keep them playing it for a while. A free-to-play game with a full story, online multiplayer, and a decent amount of characters unlocked has been shown to be enticing enough to attract a lot of downloads. But if for honor’s base isn’t that strong ,i don’t thing that those players will stick around for long, and certainly won’t put any money into new characters / DLC. Now is the time to play. This might well be the game’s last standpoint. The Starter Edition is only being free for those who download it right before August 27th, so get it as quickly as possible.